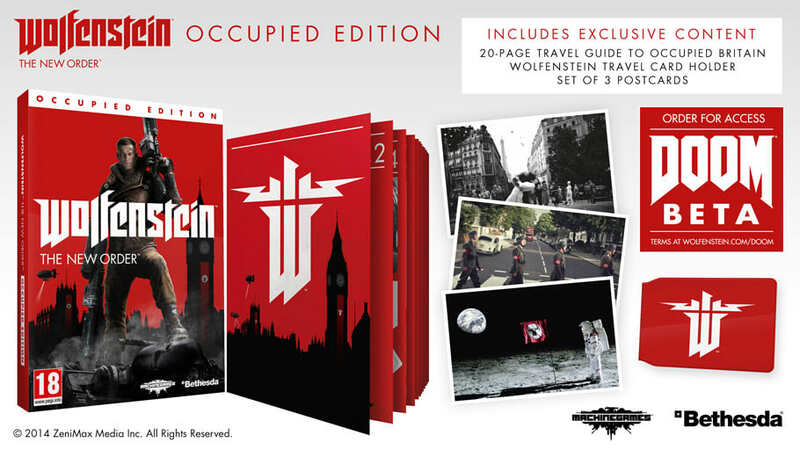 Get closer to the world of Wolfenstein than ever before with the Occupied Edition, available Only at GAME, which includes a 20-page travel guide to occupied Britain and more! The Action and Adventure - Wolfenstein's breath-taking set pieces feature intense mountain-top car chases, underwater exploration, player-controlled Nazi war machines, and much more – all combined to create an exhilarating action-adventure experience. DOOM Beta invite included with game purchase. Platform/console restrictions will apply. Must be 18+ to participate. Access subject to requisite platform/console subscription, timing and territories, to be determined at Bethesda’s sole discretion. Participation requires Internet connection and acceptance of Beta agreement. Additional terms and conditions may apply. See www.wolfenstein.com/doom or inside packaging for more details.